Created as the coat-of-arms or archival seal of Munich in 1239, the centrally depicted Münchner Kindl (Munich Child) has evolved from a hooded monk standing in front of Munich’s gate to a charming child and symbol of the city. 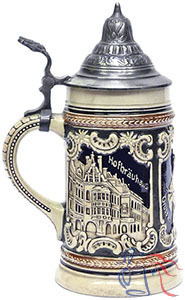 The Hofbráuhaus and Ruhmeshalle (Hall of Fame), two well-known Munich landmarks, are pictured on the sides of the stein. See also Nos. 434, 436 and 444.